In a marketing environment, attributes can track participants and their individual results of a marketing promotion or advertising campaign. 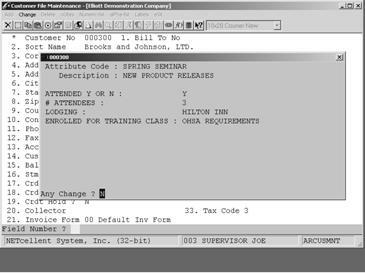 In a service environment, they can track service contracts, expiration dates and amount of contract. In regulated business, they can track licenses, requirements, as well as business restrictions by geographical area. These are extensions to a master record to track information not available within the system. Unlike Notes, which are free-form text, attributes are structured to standardize the information from master record to master record. Fields should not contain a period (“.”), especially if you want to access field information for reporting issues. 5 Flags of user defined fields for user input when needed. 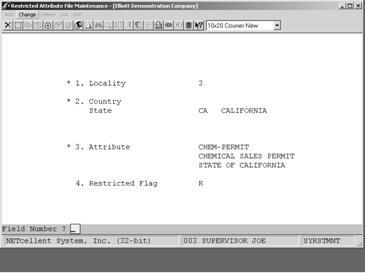 3 Date field flags with user defined literals for user input when required. 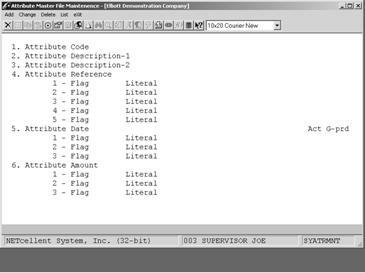 3 Amount field flags with user defined literals for user input when needed. To attach an attribute, open the master record, click the Attribute Icon or press F11. The first step is to define an Attribute Master File. This defines the attribute for use at the master record level. The second step is to define the Restricted Attribute File. This controls how the attribute is restricted. In our first scenario we are a Master Distributor with certain items that cannot be sold into the State of California. This field is the equivalent of a customer, Item or Vendor Number. 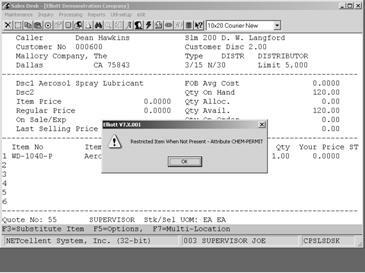 Restrictions applied at time of COP or Sales Desk line item entry and the Master Attribute must be attached to the Customer and Item attribute file. When this attribute is attached to the master record, it will not allow the sale of the item. If this attribute is not attached to the master record, it will allow the sale of the item. When using Expiration Dates in Restrictions, you must use Type “R” restrictions. Since our “By Example” restriction is for California only, it was much easier to use type “P” since “R” would have required us to enter the other 49 states. When attaching attributes to inventory items, it is much easier to attach them to a product category rather than item-by-item. The same applies to Customer Type for customers. Since we do not have our A/R Customers in a category (Type) for California, we must attach the attribute to each California customer. Now the system knows not to sell an item into California but does not know what item. To do this, we can do it by product category and then make sure saleable items to California are not in this category. If the number of Items Not For Sale is insignificant, it might be better to attach the attribute item by item. When attaching the attribute to an inventory item, it is not necessary to complete the Attribute Fields. To attach an attribute, open the master record and click the Attribute Icon or press F11. We have created a Master Attribute File and then placed restrictions for it in the Restricted Attribute File. 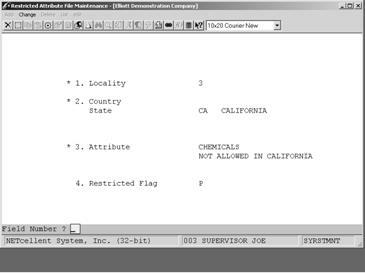 We attached the attribute to the California Customers, (Customer Attribute File), and the Not for Sale items in California, (Inventory Item Attribute File). In many regulated businesses a license or permit is normally required to do business. In this scenario we will show you how to track licenses/permits, prohibit processing sales orders if the license/permit has expired or if the customer does not have a permit. Flags 1 and 2 are how the user will update the Customer Rile (database extension). 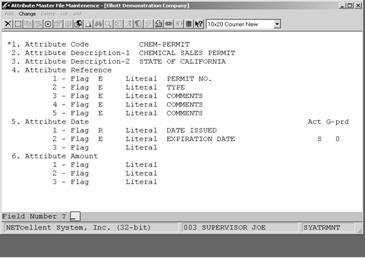 Flags 3 –5 are optional and only included should the user wish to track additional information. Note: Restricted flag, Field 4, must be R to verify expiration date in the attribute file. Since “R” = Restricted When Not Present, any California Customer who does not have this attribute attached to his file will be prohibited from buying the item, regardless of expiration date. Note: Customers permit has expired. 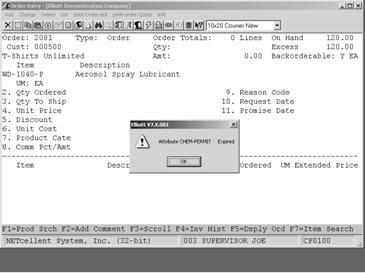 Note: Depending on the Attribute Default Action Type, S or H, the item may not be added to the order or the whole order will be put on hold. Since attributes are extensions and/or controls to a master record, there are no pre-defined reports. 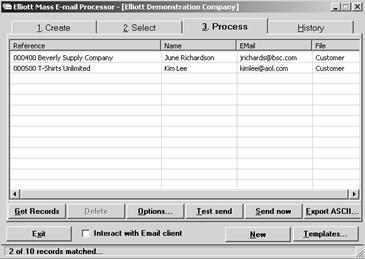 However, you can compile reports with a report writer or use the Mass E-Mail program to access the data and move it to a CSV format file. 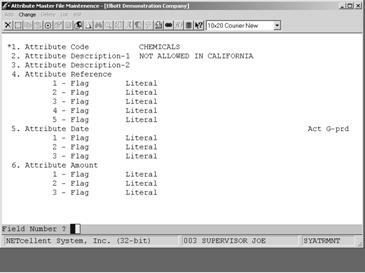 Report Required: Customers who have a permit to sell chemicals in California.